Generally speaking, the first impression of Airport is grand area and numerous people. Take the Hong Kong international airport for example. It has several hundred boarding gates. It takes almost half an hour to walk from the first gate to the last one. The staffs who are working in the airport share the same trouble when it comes to handling the problems in different places. Although airport offers exclusively four-wheeled vehicles for staffs, they are too large and heavy to run flexibly. Here is a typical example. Last month, a passenger lost her delivery note and the airport staff helped her to fulfill some related formalities. It's really troublesome for staff to drive four-wheeled vehicle. But now, airport staffs have an excellent helper and its name is Fosjoas V6 self-balancing one wheel electric scooter. 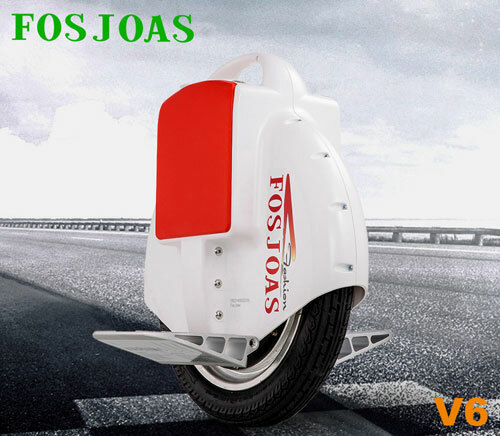 Fosjoas V6 electric unicycle enjoys the smallest size and lightest weight when compared with others, but its function is never inferior to others. The small figure makes it weave among crowds and different places freely and quickly. Its maximum speed is 18km/h, which is enough for running within airport. Meanwhile, it is equipped with advanced SONY lithium-ion battery, which not only ensures sufficient power, but also low electricity consumption. According to the practical test, it only costs 1Kwh per 100km. Fosjoas V6 self-balancing one-wheel electric scooter also improves the working efficiency of airport staffs. On the one hand, airport staffs can ride Fosjoas V6 electric scooter effortlessly, which mainly benefits from the adopted aerospace attitude control theory, fuzzy software algorithm and gyroscope system. Then, staffs slightly lean forward and Fosjoas V6 electric scooter will advance automatically. Likewise, leaning backward makes it automatic brake. Therefore, it saves physical strength for staffs. On the other hand, it can take staff to anywhere with airport. If the destination is too far, staff can take metro and carry Fosjoas V6 by hand. From now on, working in airport becomes more interesting than before.